Below is an article that I wrote for The Royal College of Physicians End of Life Publication (February 2018). Tomorrow I will be speaking at NHS Central & North West London as they launch of their new End of Life toolkit . The event will conclude with a Death Cafe. *This event is only available for NHS Central & North West London professionals. I will be speaking with Penny Smith on TalkRadio from 8am this Saturday to discuss death in today’s digital world. Tumblr, is a highly visual and popular blogging platform. It is used by brands to highlight content visually and often in a comical way. Tumblr currently hosts 174.4 blogs (March 2014) and brands often use the service to engage with younger audiences. If you have a visual ir youth orientated brand and are not yet using the service and think that it may be of interest then get in touch. A recent study by Advertising Age found that more than half of marketer and agency professionals surveyed predicted they would increase ad spending in digital media during the next 12 months. This is a far greater percentage when compared to the same for traditional channels such as cable TV (31%), broadcast TV (20%), magazines (14%) and national newspapers (11%). Social Media TV's (aka Social Media TV's & SMART TV's) are transforming the way in which we watch TV and consume content. Social Media TV's allows viewers to share and discuss what is being watched. Further content can then be consumed or interacted with by the viewer using the SMART TV or a 'second screen' such as a tablet or a mobile phone. Social Media Strategist helps market Social TV manufacturers, app developers and organisations looking to extend their business into this new area. I am a media partner Social TV World Summit & the Digital TV Summit 2012. I am also speaking at the Digital TV Summit 2012, more information about the panel and fellow speakers can be read here. Experiential marketing is all about giving people an experience that coincides with the brands image and it’s brands projection. By giving someone an ‘experience’ they are more likely to become a customer, a fan and a lifelong advocate for the organisation. I have devised and delivered a range of different experiential marketing campaigns for brands and organisations in a variety of sectors. Nokia wanted to engage with developers and communicate with them after the UK’s largest mobile developer conference ‘ Over the Air’. 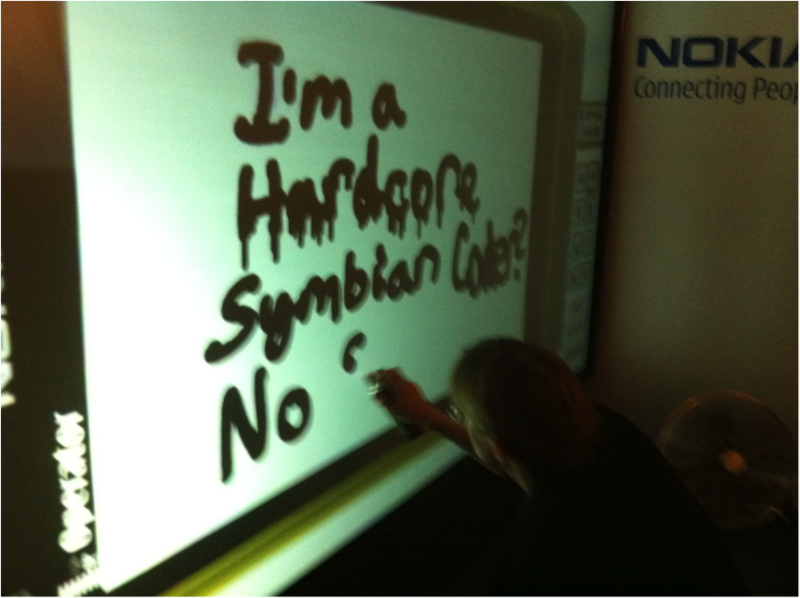 I brought in a giant and interactive graffiti wall and encased it into a giant Nokia N8. 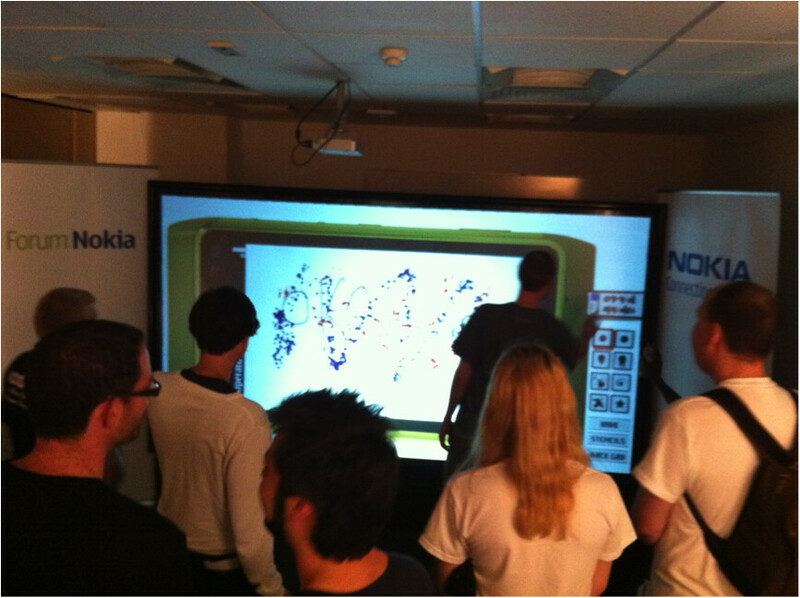 Over the course of the two day conference over 100 developers created designs on the (giant Nokia N8’s touch screen). Each design was printed onto a free T-shirt for the developer and their emails addresses collected once each design was completed. This lead to a hugely positive brand experience that each developer will not forget, targeted data for Nokia to use and build long and meaningful relationships from, and a large buzz at the conference (and on Twitter) surrounding Nokia (surpassed only by Tim Berners Lee seminar). More information about the event can be found here. I devised an immersive social media experience for Shangri-La at Glastonbury Festival in 2011 and 2012. It was called 'The Social Media Experiment' and explored and pushed the boundaries of performance, digital media and storytelling.